This two stage electric compressor has an 80 gallon tank. It is a 3 cylinder and produces 17.4 CFM @ 175 PSI. This two stage electric compressor has a bigger tank than model #5HT8 @ 120 gallons. It is a 3 cylinder also produces 17.4 CFM @ 175 PSI. This two stage electric compressor has an 80 gallon tank. It is a two cylinder and produces 18.0 CFM @ 175 PSI. This two stage electric compressor has an 80 gallon tank. It is a 2 cylinder and produces 23.2 CFM @ 175 PSI. This two stage electric compressor has an 80 gallon tank. It is a 3 cylinder and produces 34.2 CFM @175 PSI. This two stage electric compressor has a 120 gallon tank. It is a 3 cylinder and produces 34.2 CFN @ 175 PSI. This two stage electric compressor has a 120 gallon tank. 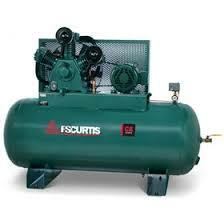 It is a 3 cylinder and produces 46.5 CFM @ 175 PSI.